Find artworks, auction results, sale prices and pictures of José Agustín Arrieta at auctions worldwide. each: 22 3/4 by 33 7/8 in. each: 26 by 36 in. These works are currently in Mexico. Prospective buyers may contact Sotheby's representatives in Mexico City and Monterrey for an appointment to view the works. Please contact the Latin American Art Department with shipping inquiries. To truly appreciate the beauty, both visual and intellectual, of " Still Life " painted by Mexican artist Agustin Arrieta (1803-1874), is necessary to remember that he was an artist born in Tlaxcala, an artist of absolute poblanaroots. As to be expected, Arrieta had a strong academic background oriented towards the assiduous copy and study of European painting. Together, these factors explain the remarkable realism reached by artist, consummated in the rich details, classical sources and models he often used for inspiration. Misnamed Still lifes, the present paintings should be considered, strictly speaking, " Dining Tables," as they have a greater affiliation with Flemishvanitas, which were very much in demand by mid century poblanos collectors and important patrons of Arrieta himself. While they are neither painted in the Spanish manner, nor in the inanimate nature of the Italian tradition, these works do allude to the dessert tables and banquets of Nordic painters like Frans Snyders (1579-1657), a fact already mentioned by Arrieta\’\’s contemporaries. 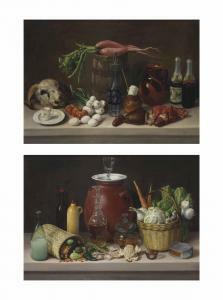 It is interesting to note that most vanitas paintings by Arrieta are not signed. Originally painted in sets of 2, 4, 6, 8 and even 12; only one painting in each group was signed; these series correlated to different seasons, religious festivals, harvesting cycles, as well as the values and customs of the region of Puebla- Tlaxcala. 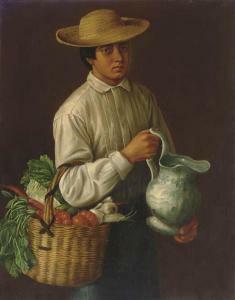 By the year 1853, Agustín Arrieta had excelled in his craft, painting dining tables with a virtuoso\’\’s technique for the handling of textures, proportions, the finest chromatic qualities for fruits, flowers and vegetables; even meats, breads and sweets shared the same compositional space. Objects arranged in these compositions only appear to have an arbitrary order. Careful observation will reveal quite the contrary. 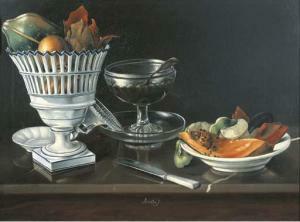 Visual balance and composition were of crucial importance to Arrieta. Objects of popular tradition share a universe with Baccarat crystal decanters, inhabitants of a sophisticated cosmopolitan culture; old Parisian porcelain and silver converese with clay pots, wicker baskets and kitchen utensils in copper and aluminum. Through his works, the viewer explores an undeniable rich heritage: the Baroque culture of New Spain and the illustrated encyclopedias characteristic of the Age of Enlightenment. Above all, Arrieta's painting is a celebration of Mexican culture where a shared dining table represents a sense of belonging, a ritual of mexicanidad. Both works are in generally good condition overall. New stretchers have been installed as a result of recent restoration. For refurbishment purposes, tacking edges have been added to all four borders, attached to the stretcher with staples, only visible in the back. Discoloration all along upper and lower borders probably caused by aging or previous frames. Slight abrasion is present in some areas of both paintings. In response to your inquiry, we are pleased to provide you with a general report of the condition of the property described above. Since we are not professional conservators or restorers, we urge you to consult with a restorer or conservator of your choice who will be better able to provide a detailed, professional report. Prospective buyers should inspect each lot to satisfy themselves as to condition and must understand that any statement made by Sotheby's is merely a subjective qualified opinion. Exhibition catalogue, Homenaje Nacional José Agustín Arrieta (1803-1874), Mexico City, Museo Nacional de Arte, Consejo Nacional para la Cultura y las Artes, 1994, p. 184, nos. 106 and p. 205, no. 125 (illustrated in color). Mexico City, Museo Nacional de Arte, Homenaje Nacional, José Agustín Arrieta (1803-1874), 1994, no. 106 and 125. Francisco González, Galerías La Granja, Mexico City. By descent to the present owner. E. Castro Morales, Homenaje Nacional: José Agustín Arrieta (1803-1874) su tiempo, vida y obra, Museo Nacional de Arte, INBA, Mexico City, 1994, p. 224, no. 143 (illustrated in color). E. García Barragán, José Agustín Arrieta: Lumbres de lo cotidiano, Fondo Editorial de la Plástica Mexicana, Mexico City, 1998, p. 54 (illustrated in color). Mexico City, Museo Nacional de Arte, Homenaje Nacional: José Agustín Arrieta (1803-1874) su tiempo, vida y obra, August - October 1994, no. 143.